Denali from the Southwest. AAI Collection. All expeditions begin with a meeting and orientation in Anchorage. 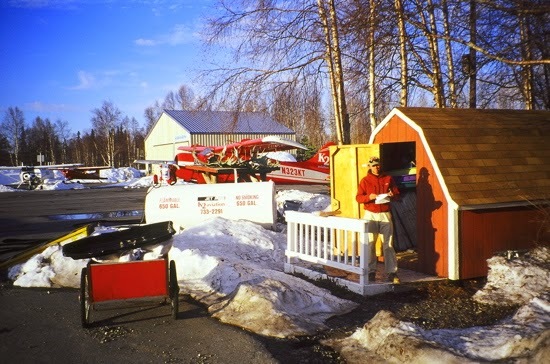 We spend one night there, then travel by van the next morning to the small town of Talkeetna. There we repack our equipment, meet our ski plane pilots, and as soon as possible, make the beautiful flight to the Kahiltna Glacier at 7300 feet. Soon after our arrival and a review of glacier travel procedures, we begin moving to our first camp. We establish our Camp 1 at 7800 feet at the confluence of the main Kahiltna Glacier and its rugged Northeast Fork, the approach for West Rib and Cassin Expeditions. Enjoying spectacular views the whole way, we continue on to Cache 1 at 9800 feet and Camp 2 at 11,200 feet while snowshoeing up moderate terrain. 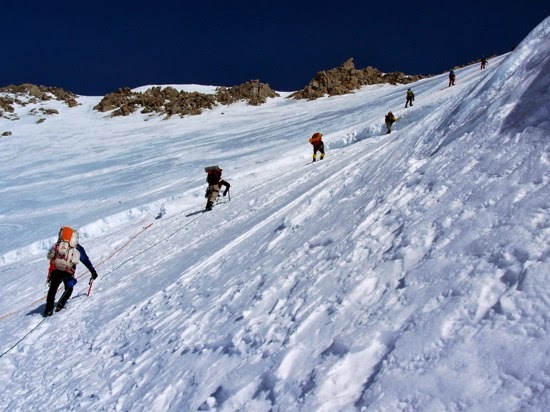 As we do throughout the climb, we travel in rope teams because of the ever-present crevasse hazard. To ease the burden of moving our expedition supplies, we use specially designed sleds that we tether to our packs and pull along the gentle sections of the lower mountain. Above Camp 2, the climbing steepens as our route takes us past the terminal walls of the West Buttress. We usually cache our snowshoes at 11,200 feet and continue our climb with crampons because of the gradient of the route and the hardening snowpack. We climb out of a basin to reach Windy Corner at 13,100 feet, then make an ascending traverse through seracs and heavily crevassed terrain as we approach the head of the Kahiltna Glacier at 14,200 feet. We enjoy spectacular views as we look down to the lower Kahiltna and out to 17,004-foot Mt. Foraker. In the other direction the impressive summit bulk of Denali rises above us, and we can easily see the details of the upper West Rib and Messner Couloir, as well as the steep headwall of the West Buttress that we will soon climb. At Camp 3 (14,200 feet), we take a well-deserved rest day and make final preparations for our summit bid, reorganizing our gear for the carry to the highest camps. Ascending the lower part of the fixed lines. and the crest of the Direct West Buttress. 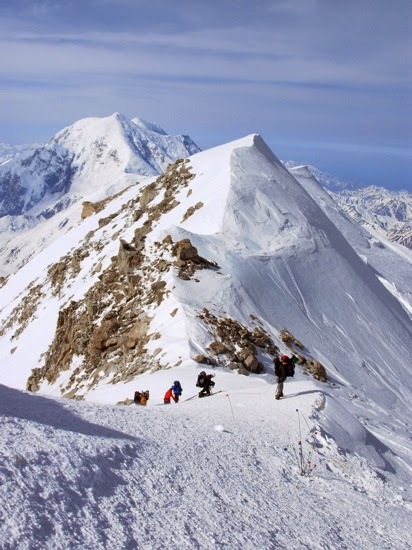 Check out our Virtual Tour of a full Denali West Buttress expedition. The photos take you from the streets of Talkeetna to the summit of North America. 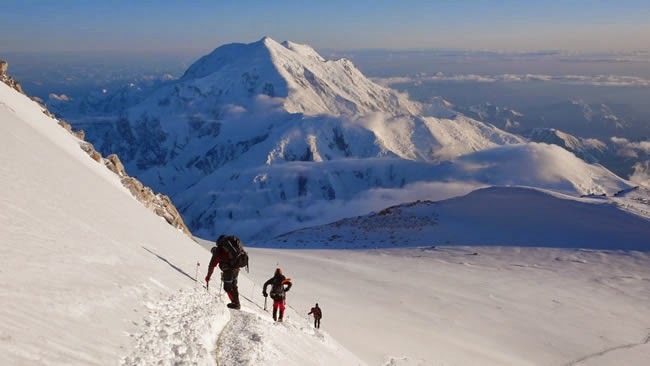 Have you been training hard lately, but haven't committed to a Denali team? We still have a few spaces open for 2014 and are taking reservations for 2015. Don't wait until the last minute!